Gus Hansen has done it, he's found his way into the $1,000,000 Big One for One Drop that kicks off on Sunday at 1:11 PM PST here in Las Vegas. The world's largest poker tournament in the history of the game will now have another one of the world's largest players in Hansen. When the $25,300 One Drop Mega Satellite began, big names were everywhere in the field. 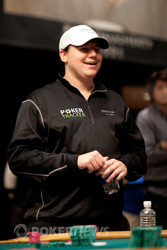 At the end of the registration/re-entry period, 96 entries were tallied and a prize pool of $2.4 million was created. The first two spots would be awarded seats and third place was set to get $400,000. On the way to the final table, Phil Ivey, Jason Mercier, David Benyamine, David "Doc" Sands, Scott Seiver, Hasan Habib, Viktor Blom and Luke Schwartz were all eliminated. When action got down to the final table, there were a few well known faces and some amateurs who made it as well, but only the top three would be paid. Steve Meling was hoping to turn a $65 satellite into a $1 million entry, but he fell short, as did another amateur Hani Awad. On the bubble, Will Failla, Jason Somerville, Gus Hansen and Shaun Deeb were trying to find the last person to go home empty handed. That player happened to be Failla when he fell in fourth place. Somerville went out next in third and earned $400,000, while Hansen was left to fight with Deeb. After a short, unscheduled break, Deeb quickly lost the heads-up match to Hansen. Deeb earned a seat himself for finishing in second place, but he was put on the alternate list as only one seat was guaranteed to the event. Hansen won his way in, while Deeb will have to wait and see if he gets in tomorrow. The consensus seems to be that Deeb won't get into the event, and in that case, he'll be awarded the cash. Hansen joins the likes of Eugene Katchalov, Ben Lamb, Erik Seidel, Daniel Negreanu and Dan Shak in tomorrow's One Drop event, which will kick off in the early afternoon. In late-breaking news, closing out the registration list in the event will be Phil Hellmuth, who acquired the seat from the MGM Resorts International VIP winner. You can see the entire list of players here and you won't want to miss any of the action live from PokerNews tomorrow as history is made. We'll see you then and for now, goodnight from Las Vegas! 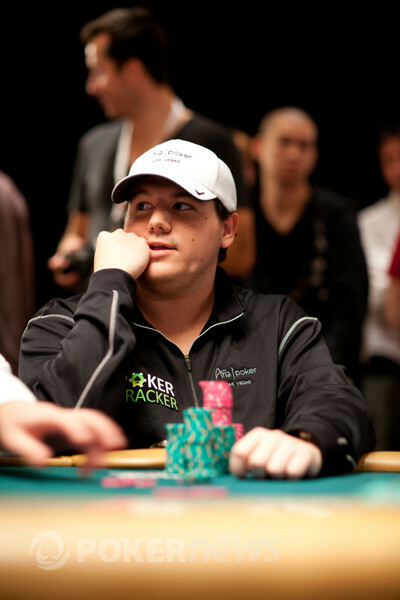 Shaun Deeb was all in for less than the ante for his final 5,000 holding the . Gus Hansen had the . The board ran out and Hansen's jack-high straight won the hand and the tournament, eliminating Deeb in second place. For his finish in second, Deeb earned a $1,000,000 seat into the Big One for One Drop. Because there is only one seat held for the satellite winner, Deeb will go to the bottom of the alternate list and most likely not get into the event. If Deeb doesn't get a seat, which is expected, he'll receive the $1,000,000 cash. Hansen, on the other hand, has earned himself the official seat to the event tomorrow, which kicks off at 1:11 PM. On the first hand back from the unscheduled break, Shaun Deeb raised to 3.24 million and left himself with just one T5,000 chip. Gus Hansen called and the flop came down . Hansen bet 25,000 and Deeb quickly folded. 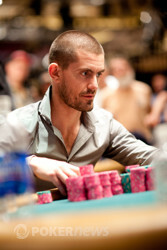 Deeb dropped down to just a mere 5,000 in chips while Hansen moved to 7.195 million. After a short break, the two players are back in action. The remaining two players have taken a short, unscheduled break. 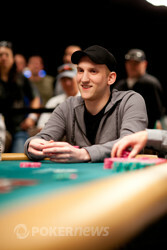 Gus Hansen raised to 210,000 from the button and Jason Somerville reraised all in for 910,000 from the big blind. Hansen called and tabled the . Somerville held the . The flop gave Hansen a pair of aces, but Somerville picked up the nut flush draw. The turn was the and the river the . 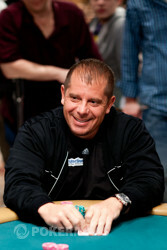 Hansen's two pair of aces and sevens were the best hand, sending Somerville out the door in third place for $400,000. It's now Shaun Deeb versus Hansen for the guaranteed seat to the Big One for One Drop. Second place will get a seat, but that player will be placed on the alternate list and most likely not get in. In the likely case the player doesn't get in, he will be awarded the money. Below are the chip counts to start heads-up play. Will "The Thrill" Failla moved all in from the small blind for 380,000 after action folded to him. Shaun Deeb called from the big blind with the . Failla held the . The board ran out and Failla's hand was second best. He finished in fourth place while the final three players have all locked up a minimum of $400,000.